Marco Wittmann won the DTM race 2 at Moscow Raceway to became the championship leader with three rounds remaining. This was a great day for BMW after managed to repeat Mercedes’s success from Saturday and grab top 4 places. Former champion Wittmann, who finished 19th in the Saturday’s race, took the pole position ahead another two BMW drivers Tom Blomqvist and Maxime Martin but the Belgian damaged his car badly after having spun into the gravel and as a result, he was forced to start from the pit lane. Robert Wickens on fourth was the best ranked Mercedes driver while neither of the Audis was in the top 10 at the start. The conditions on the track were much better than for the first race so we could see more proper racing at Moscow Raceway. After 15 minutes Wittmann already had an advantage of 5 seconds, while in the middle of the grid Audi drivers, Edoardo Mortara in particular, were desperately trying to move into the points zone. Many of the Mercedes and Audi drivers opted for an earlier mandatory pit-stop and that worked relatively well as some of them collected some points. The BMW’s were absolutely dominant and no one could stop them on their way to victory. Wittmann managed to keep his position and to score the second victory of the season, after which he is on the top of the standings, 12 points ahead of Wickens. Blomqvist finished at the 2nd place in this race while Bruno Spengler moved up to the 3rd position. Augusto Farfus completed BMW’s 1-2-3-4, what is the same achievement Mercedes scored a day earlier. 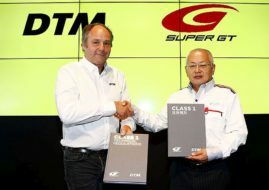 The next DTM round will go on September 10/11 at Nurburgring.